Roy Linden can run like a deer, but his tongue is another story. His stutter prevents him from making friends and keeps him labeled a loner. His running isn’t doing him much good either. Everyone in his small Kentucky hometown thinks he could be great in football, but without a decent quarterback, no one outside Johnstown will ever see him. Roy’s luck changes when legendary high school quarter back Waymen Witley moves to town. Together, Waymen and Roy are unstoppable on the football field. But Roy has plenty to distract him from his growing fame. Birds have been dying on his Gram’s property. Roy knows something is wrong with the water, but he can’t get anyone to listen to him. Something strange is going on, and someone high up is pulling strings to keep it quiet. Roy fears his gram is in danger. What will he decide when he starts receiving threats? I’m not a big football fan when it comes to the sport itself, but I seem to enjoy a lot of football stories (Facing the Giants anyone?). 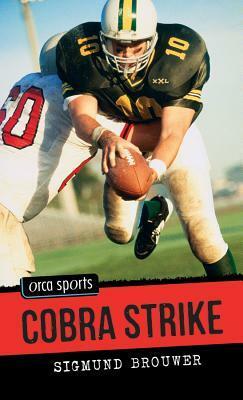 I first read Cobra Strike several years ago and enjoyed it enough to re-read it out loud to my mom. I enjoyed it again as I re-read it this week. It’s a quick read (I suspect it may have been written as a hi-lo book), but totally worth it. Let me know what you think! Bonus points: Cobra Strike is written from a Christian perspective!